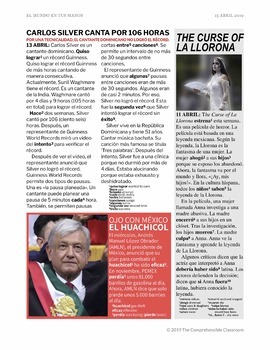 This is the April 15 issue of EL MUNDO EN TUS MANOS. If you are a subscriber, please visit the subscription listing (linked below) to access this issue. It is a PDF only. 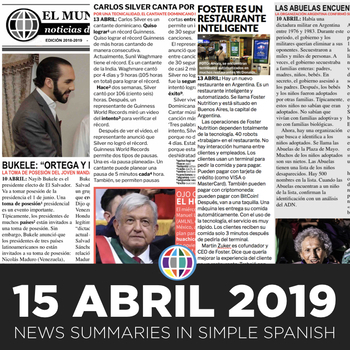 EL MUNDO EN TUS MANOS is a news publication that provides comprehensible news summaries from Spanish speaking countries to students. 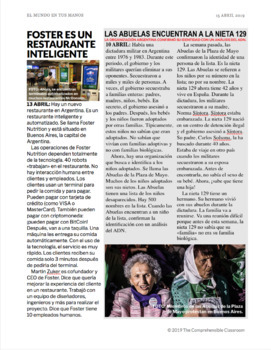 The target reader for this publication is a student in his or her first or second year of Spanish. Two versions of the issue are included: one with footnotes of key or likely unfamiliar words and a second, slightly expanded version without footnotes. » Weekly (37 issues) »» BEST DEAL«« Click here to subscribe. 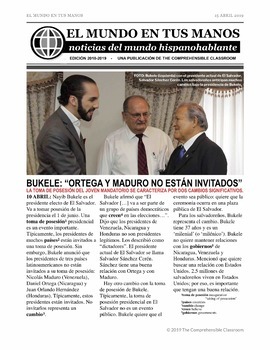 » Bi-Weekly (19 issues) - Click here to subscribe. » Spring Only, Weekly (20 issues) - Click here to subscribe. Subscribers have access to PDF and editable versions of each article in addition to supplemental resources and teaching ideas. Use past issues to enrich your study of countries and topics in your classes!